The old town is full of small restaurants tucked away on narrow streets. 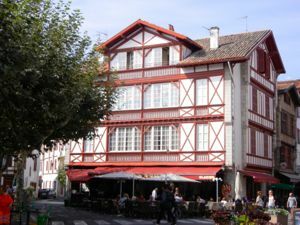 There are several areas of St-Jean-de-Luz where you'll find a lot of restaurants. The Place Louis XIV, near the Maison Louis XIV and just across from the port, has a number of cafés that offer outdoor seating in good weather. It's a great place to sit and people watch, while enjoying a glass of wine and perhaps some local ham. Heading from there toward the beach are two narrow streets that are lined with restaurants: Rue de la République and Rue Tourasse. The area near the market also has a number of cafés and restaurants. You'll find plenty of seafood, as well as some local specialties. Many things will be seasoned with Piment d'Espelette, a mildly hot pepper from the nearby town of Espelette. And don't forget to finish your meal with some delicious Gateau Basque, a rich cake with a filling (usually cherry jam, sometimes cream). Above, Outdoor café near Place Louis XIV, St-Jean-de-Luz.